Frank Gehry’s hideous design has finally cleared the last official review-board hurdle. A groundbreaking ceremony is set for November 2. Only one man can end this travesty. A few years ago, I attended a Washington book-signing party hosted by a quintessential Republican insider. During a brief conversation with my host, I mentioned celebrity architect Frank Gehry’s self-indulgent, very expensive, and very unpopular design for a national memorial to Dwight D. Eisenhower, whose fate now lies in the hands of Interior Secretary Ryan Zinke. “Of course it’s awful!” my host exclaimed of the design. But now, in a shining example of the go-along-to-get-along ethos that helps make Washington the swamp it is, he is one of the many establishment figures who have signed on as members of the Eisenhower Memorial Commission’s advisory committee. 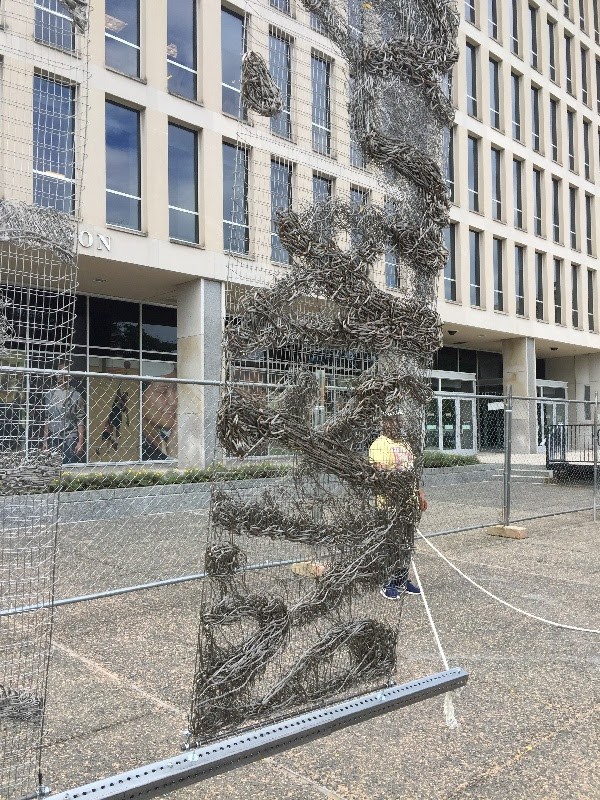 The EMC is sponsoring this $150 million boondoggle, to be erected almost entirely at taxpayer expense, and Congress and the White House are on board. White House support, however, is presumably shallow, given Gehry’s remarks that likened President Trump’s election to the Nazi takeover in Germany. After seven years, Gehry’s design, which features a humongous steel-cable billboard as tall as the Lincoln Memorial and well more than twice as wide, has finally cleared the last official review-board hurdle. The EMC has scheduled a groundbreaking ceremony for November 2. Only Zinke can put an end to this travesty of Ike’s memory—by denying a building permit for the design’s execution. Here are three reasons the memorial has no business being built. First, Gehry did not win a fair, open competition. The EMC’s original chairman, Los Angeles businessman Rocco Siciliano, is a friend and admirer of Gehry’s and dropped his name at the commission’s first board meeting in 2001. The EMC and its collaborators at the General Services Administration not only required competition entrants to be established professionals but also to submit their portfolios instead of memorial designs. 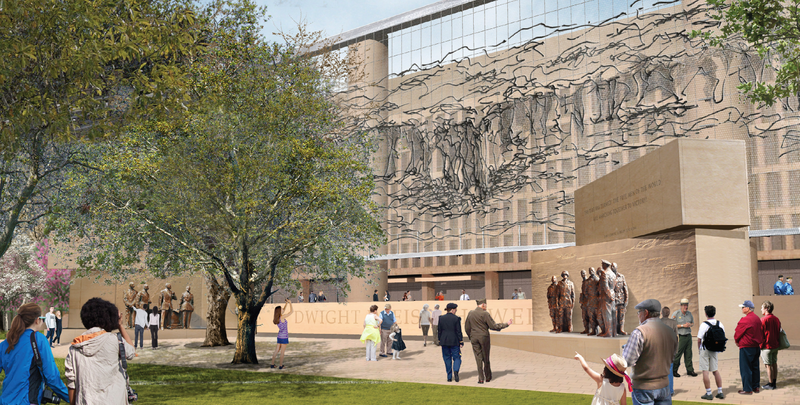 Only the seven semi-finalists were required to submit merely suggestive sketches of what an Ike memorial might look like. Second, Gehry’s design is mainly about Gehry and his postmodern envelope-pushing, not the wartime Supreme Allied Commander in Europe and 34th president of the United States. His pretentious billboard, which he calls a “tapestry” and Ike’s granddaughter Susan once dubbed an “Iron Curtain,” is a stage-set backdrop to a sprawling, four-acre Ike theme park, as opposed to a monument worthy of a defining figure of the American Century. 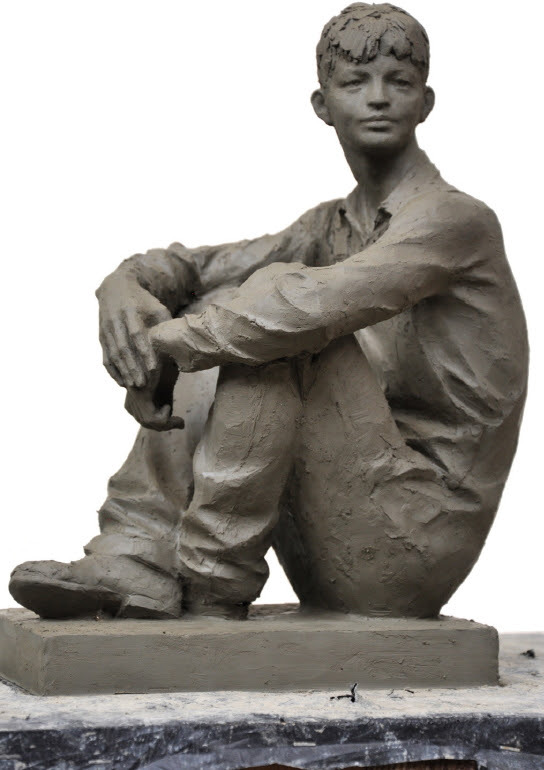 A kitschy sculptural diorama consists of a young Ike peering out, from a corner of the park, at his future self as D-Day commander and president in the memorial core. The tapestry, to be perched on six gargantuan stone-clad shafts ten feet in diameter, was originally to be stitched with a Kansas landscape pointing to Ike’s rustic roots. In the design’s final iteration it is adorned with a plethora of squiggly lines intended to represent the Pointe du Hoc at Normandy Beach. The billboard will be situated in front of the U.S. Department of Education’s headquarters, facing the National Air and Space Museum from across Independence Avenue. 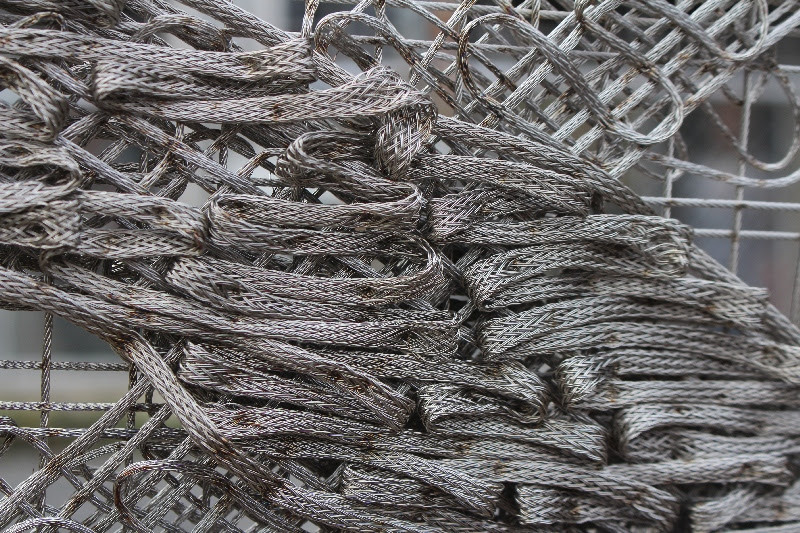 Not only will it baffle the public, it might well generate expensive maintenance problems due to the accumulation of dirt, bird droppings, trash, and ice, along with eventual deterioration of the steel cables. Susan and her siblings stuck by that consensus until September of last year, when former Secretary of State James A. Baker convinced Susan to abandon her opposition in exchange for changes in the billboard theme and the placement of the young Eisenhower statue. After the grandchildren caved, congressional opposition to the Gehry design waned. The fact remains that Ike deserves an adult memorial, not an adolescent exercise in postmodern theatrics. What a pity that Ike’s fellow Kansans, former senator Bob Dole and current senator (and EMC chairman) Pat Roberts—the key figures pushing this fiasco forward—have been bamboozled by Gehry and his clueless hangers-on in the media and in Washington’s dysfunctional cultural apparat. It’s up to Zinke to take a stand for Ike and the taxpaying public by consigning this dismal example of DC business-as-usual to the dustbin. Zinke should tell the EMC to start over and try something sensible for a change. Catesby Leigh’s commentary on public art and architecture has appeared in the Wall Street Journal, City Journal, Weekly Standard, National Review, and other publications. He lives in Washington.